The Herd - peaceradios jimdo page! 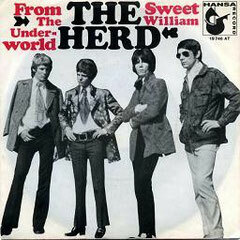 The Herd est un groupe de Pop anglais de la fin des années 60 qui Lança la carriére du guitariste /chanteur Peter Frampton. Peter Frampton (vocals, guitar) — born Peter Kenneth Frampton, 22 April 1950, Stone Park Hospital, Beckenham, Kent. Andy Bown (keyboards) — born Andrew Steven Bown, 27 March 1946, The City, London. Gary Taylor (bass) — born Graham Taylor, 28 November 1947, Walton-on-Thames. Andrew Steele (drums) — born Andrew Roy Malcolm Steele, 2 August 1941, Hendon, North West London — died 18 April 2005, Alaska, U.S.
Henry Spinetti (drums) — born Henry Anthony George Spinetti, 31 March 1951, Cwm, South Wales.